On Thursday 29th June we once again ran our annual Road Safety Awareness Day. Organised by Emma Gliddon, Year 9 received invaluable education on the effects of drink and drugs and anti-social behaviour from Holsworthy Neighbourhood Police Team. They spent time talking to the students about how their behaviour can impact others negatively and how alcohol and drugs affect you both mentally and physically. They also tried out ‘beer goggles’ to simulate the effect of alcohol and how your perceptions change. Unfortunately when consuming alcohol these changes come on more subtly, so you may not be aware of the full impact, thinking you are more capable than you actually are. There was also a session by the Devon Air Ambulance. They talked about their work and how invaluable it is when we live in a rural area. They also talked about how they fundraise and how much it costs to operate each year, as it is a charity and receives no government contributions to run. This was really enlightening and something which we can easily take for granted. Students also spent time with Devon and Somerset Fire and Rescue, who showed some pretty graphic videos. Shock tactics are sometimes the best way to make people sit up and take these issues seriously. Thinking this will never happen to me doesn't always work! 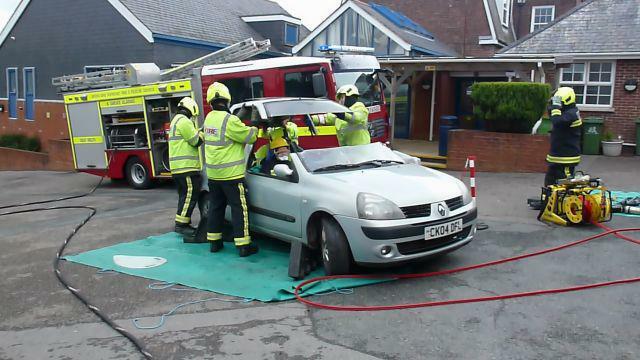 The day culminated with a demonstration by Devon and Somerset Fire and Rescue and PCSO Rowe. Students were talked through the procedures the emergency services follow once they receive a 999 call about a road traffic collision. The casualty, this year Kai Trivett, was eventually lifted from the vehicle, once it had been made safe and the roof had been cut off. The various steps were explained to students. The experience of being in the vehicle when this was all going on around him was a little scary for Kai. The message of the day is an important one and one which has been delivered by Emma for the last 11 years. The day was launched following a spate of fatal accidents affecting some ex HCC students. This had a huge impact on Emma and many others at the time and unfortunately still impacts many even now. It is testament to Emma and those that deliver these sessions that since this educational day was established we have not lost any ex pupils in road accidents. A huge thank you to the emergency services who gave up their time this year and all the previous years and a huge thank you also to Emma and her team for their professional approach and provision of yet another excellent road safety day. A video of part of the demonstration is available on the College Facebook page.